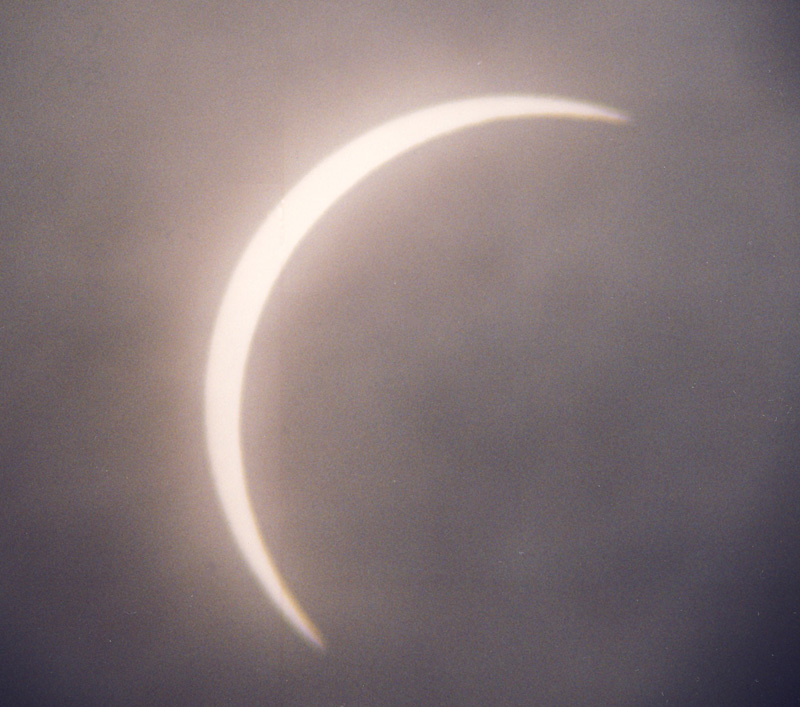 The 1999 eclipse was to be the only one visible in my own country during my life time. Eastern Turkey or Iran were expected to have the best weather but I had dreamt about seeing the eclipse in Cornwall since I was 12 years old. I met my future wife Talaat Qureshi at college when we were both studying Chemistry. She reluctantly followed me to Mexico for the 1991 eclipse. After it was over, she asked, when's the next one? I told her that the next one in England would be in Cornwall. We were married in January 1994 and had since seen four eclipses together. I discovered astronomy when I was a young boy. I and a like-minded friend, Bob Snell, used to star-gaze from the top of the dormer windows we both had outside our bedrooms. 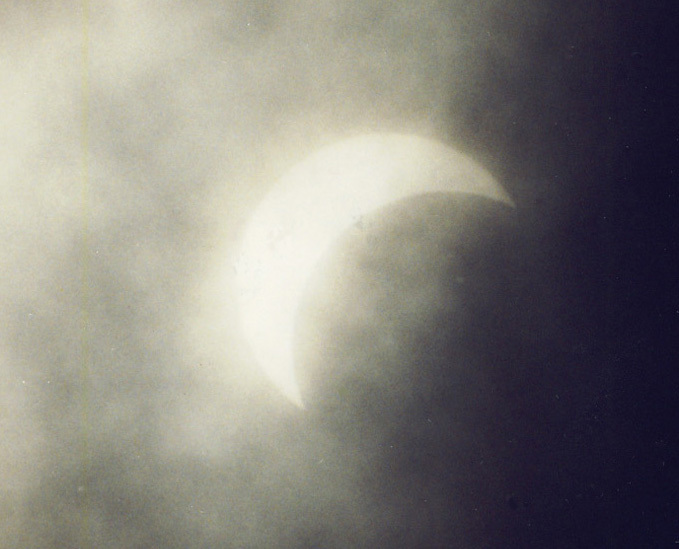 Bob and I saw a partial eclipse of the sun at school in 1966. We were taken out of the classroom to watch it in the playground. We could clearly see that the Sun had a large piece missing. We were fascinated. Reading further we discovered other types of eclipses including the spectacular total eclipse of the Sun. Many books said that the next total eclipse of the Sun in England would be in 1999 in Cornwall. Even as 12 year olds we made plans to see it together. We would be in our mid-40s. My cousin, Adam Adamou, had travelled around the world helping set up conservation projects. He has always been fascinated by my eclipse trips. I had attempted to get him to join me on previous trips, especially with his large knowledge of wildlife, but work commitments have always precluded this. The 1999 eclipse seemed the perfect opportunity for us to share this phenomenon together. John Mears has been a friend since the early 1970s. We have seen many musical bands and football matches (at Arsenal) together. John is the lynchpin of many school friendships that are common to us, often organising reunions and meals out. In 1994, John was best man at my wedding. John is a relative eclipse veteran. He had seen two with us (Mexico 1991 and Chile 1994) with a total duration of 9m 57s. After leaving school I was a civil servant for six years. David John Mitchell and I were far too eccentric for a staid government job. We gravitated together to alleviate the boredom of the work. I went to college and entered the computer industry while Mitchell disappeared to Africa to teach. Every week letters would come full of gossip, surreal observations and science questions to be answered by return of post. 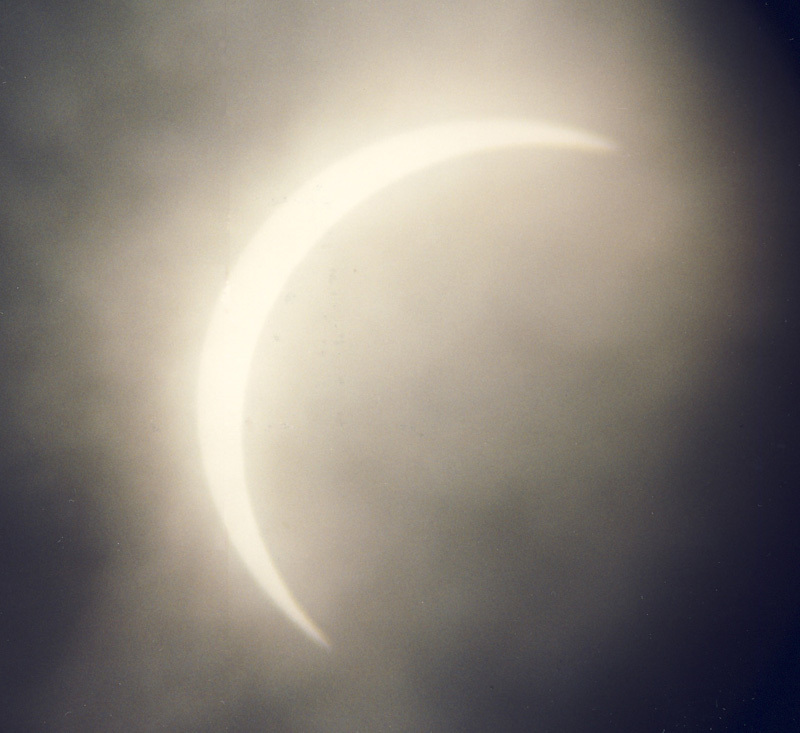 The 1999 eclipse was to be the only one visible in my own country during my life time. Eastern Turkey or Iran were expected to have the best weather but I had dreamt about seeing the eclipse in Cornwall since I was 12 years old. Talaat and I invited Bob (and wife, Angie), Adam (and wife Emma), John and the Mitchell family (wife Sylvia, son Paul) to join us in Cornwall after renting a house for the week. During the early part of the year I had been approached by a film producer from the Discovery Europe TV chanel. He had seen my previous eclipse accounts on the web and asked if I would be interested in shooting a four minute film about my eclipse chasing. I agreed and spent three days being filmed while talking about my adventures and hopes for the 1999 eclipse. This was added to a haunting soundtrack and the final product was shown on TV for a couple of days around eclipse time. Our mobile phones would not work at the house so we could not receive calls unless we left the village. Our car broke down and had to be left in a garage for a few days. This web site was suspended for a while because too many users were accessing it. We were relying on the fickle British weather. 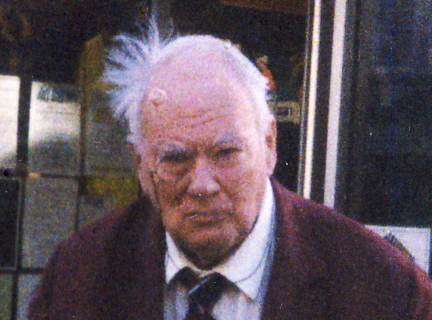 During the week, we went to a talk given by the BBCs Patrick Moore in Truro. His books had been an important influence since I was young. Later, I gave a lecture with slides about my past eclipses in a hall at St Agnes. I was enjoying the build up. However, the weather forecast for eclipse day was getting gloomier by the day. On eclipse day, we all awoke to a reasonably clear morning. Clouds could be seen in the west. Jupiter and Saturn were still visible in the twilight. Our eclipse site was 8km away and we convoyed to a small car park that we had discovered earlier. 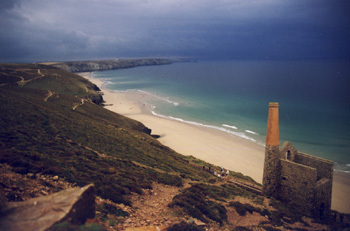 The site was over a spectacular cliff face dotted with ruined tin mines at a place called Wheal Coates near St Agnes. 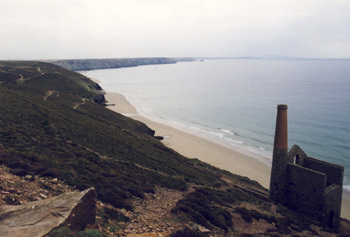 A series of rocky coves swept along the north coast to an island light-house and the bay of St Ives about 20km away. The cliff faced west from where the Moon's shadow would approach. We had the place to ourselves, apart from the clouds. It was grey and dismal. There were gaps over the sea but the weather forecast was still of a frontal system coming in from the Atlantic. The views were excellent. The Gill-Cary family (including our host Dorothy, sister-in-law, Alice, and nephiew and niece, Midnight-Ray and Rosie Lee) were among the few dozen people who joined us. These included some work friends from London, Sidh and Tina. We passed the time with tea, coffee and biscuits. The sky became greyer. We waited for the eclipse to begin. At 9:57, First Contact occurred. We could not see the Sun; the cloud cover above us was complete. 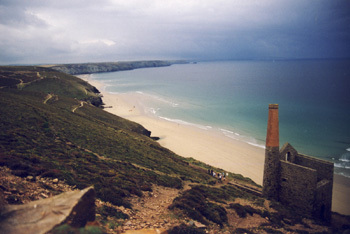 In the distance we could see rain over St Ives. There was also rain over the sea. The rain avoided us. It was difficult to tell how much light reduction was caused by the weather and how much by the eclipse. The radio reports gave no reassurance. It was pouring in Penzance. A patch of blue sky appeared in the east. The Sun was almost due south. I could see the sky colour deepening as the eclipse progressed. Around 10:55am the eclipsed Sun appeared through thinner cloud. It was a crescent. Everybody whooped with delight. The mylar filters and glasses we had were too strong for the semi-hidden Sun. Without the filters the Sun was still too bright. The Sun kept disappearing behind cloud. The rain over St Ives had moved away from us but more had arrived. Only a few spots fell on our site. Around 11:10am we saw the Sun again. It was disappearing towards totality. As the last bit vanished, a large grey cloud covered it. In the west it had been getting darker for the previous ten minutes or so as the Moon's shadow approached. It was travelling at 900 metres per second and was visible from 20km away. It resembled a huge explosion in reverse, with darkness instead of light spreading out from the centre. It darkened dramatically, much darker than I'd ever seen before. At 11:11am, totality arrived. A black blanket sat over us. Everybody was amazed at the speed of events. The horizon was glowing orange. 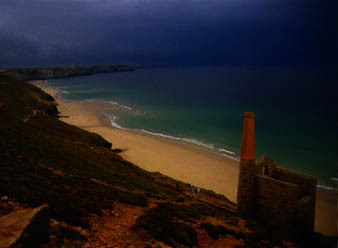 It was especially pronounced in the west beyond the rain over St Ives. Clouds hid the totally eclipsed Sun. The lights of St Ives had come on. 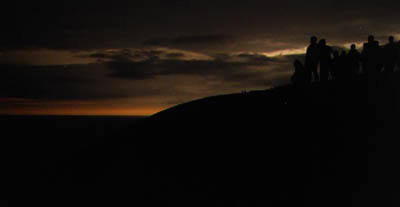 The lighthouse on Godrevy Island switched on and we could see the beam rotating. Thousands of camera flashes were visible all along the coast for several kilometres. It was the first time I had ever seen this. We could see it getting brighter in that direction as the shadow rapidly passed over us. Still no Sun could be seen. We contented ourselves with watching the rapid brightening of the sky. Totality was over. For the first time I had been clouded out and missed the corona. It had been a spectacular eclipse but without the coup de grace! Everybody else was ecstatic. Adam said he must see another with the Sun shining. Bob was talking about southern Africa in 2001. Everybody had agreed that the site had been excellent and we were all glad to have experienced the eclipse together. The TV coverage showed that the corona had been very symmetrical. Three huge pink prominences had been seen around the rim of the Sun. Most of Cornwall had been clouded out apart from a few lucky spots. Kryss Katsiavriades arranged the accomodation, wrote the eclipse account (© 1999, 2005), selected the newspaper quotes, and directed the eclipse day photography. The Location, Latitude, Longitude and Altitude (in metres) are for the observation site. The figures were measured on an interactive map provided by Fred Espinak. The Distance from Centre Line was estimated using the above interactive map. First Contact is the beginning of the eclipse when the first "bite" appears on the Sun's disk; it is the beginning of the partial phase. Second Contact is the beginning of totality. Third Contact is the end of totality. Fourth Contact is the end of the partial eclipse. The times are in local time which, for this eclipse, is UT + 1 (GMT plus one hour as there was British Summer Time in operation in August). The Duration of the eclipse at the observation site was 1 minute 54 seconds. It became very dark during totality. The Path Width is the width of the path of totality. The umbra itself is elliptical in shape. The Major Axis is the longest axis of the umbra; the Minor Axis is the shorter axis. The umbra at the observation site was 125km long and 90km wide. The path width was 104km. The Umbral Velocity is the speed of the Moon's shadow, 0.9 kilometres per second. The Sun's Altitude is measured from the horizon; the Azimuth is the direction of the Sun measured clockwise from North. The figures are for mid-eclipse. The Sun was not visible during totality. Gamma determines how the Moon's shadow, if extended, would pass through the Earth. A Gamma of zero implies that the shadow would pass through the exact centre of the Earth. A Gamma of greater than 1 misses the Earth and no total eclipse would occur. A positive Gamma passes North of the Earth's centre; a negative Gamma passes South of the Earth's centre. The value of Gamma for this eclipse is 0.5063. This means that the shadow passes north of the Earth's centre, about half of the way to the edge of the Earth. This, combined with the fact that in August, the Northern Hemisphere is tilted slightly towards the Sun, produces an eclipse in the northern hemisphere. The Diameter Ratio determines how much bigger the Moon's apparent radius is than the Sun's. In this case, the Moon's radius is 1.026 that of the Sun's. A total eclipse can only occur if this figure is greater than 1. The Moon would then appear larger than the Sun and could cover it completely. If this figure was less than one a total eclipse could not occur because the Moon would appear smaller than the Sun. The Saros is a collection of eclipses belonging to a series.  Each member of the series is followed by a similar eclipse approximately 18 years, 11 days and 8 hours later. This eclipse is a member of Saros number 145. It is the 21st eclipse out of a total of 77 in the series. Saros 145 is a series of eclipses lasting for 1370 years. The series began on 4 January 1639 with a small partial eclipse in the northern polar regions and will end on 17 April 3009 with another partial eclipse in the southern polar regions. Saros 145 consists of 34 partial eclipses, one annular eclipse, one hybrid eclipse (annular and total along different regions of the path) and 41 pure total eclipses, making 77 eclipses in all. Of these total eclipses, the longest in the series will occur on 25 June 2522 and will be of the unusually long duration of 7m 12s. The 1999 eclipse main page. Photos of most of the people with us at the 1999 eclipse. Large photos of the approach of the shadow and totality. Some newspaper accounts and a children's drawing of the eclipse. Pre-eclipse photos including the week before the eclipse in Cornwall. Many people (friends and strangers) have sent their accounts of the 1999 eclipse to this web site. These are reproduced here. An archive of all the information published on this web site about the 1999 eclipse.